Much more than a wall decoration, this Mexico wall map is big enough for several people to gather around at one time and see Mexico at a scale of 1:1,820,000 with an inset map of central Mexico at a sale of 1:1,000,000. All of the states are outlined with a bit of color so that you can easily see the state boundaries within the country of Mexico. 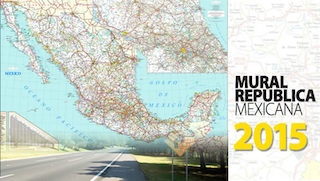 Latitude and longitude lines allow you to easily determine the location of any point in Mexico. A distance chart is also included on this map along with a legend (in Spanish) that describes the symbols used on the map. Constructed of laminated paper with plastic rods top and bottom. Comes ready to hang on your blank wall but this map will require a space nearly six (6) feet wide by 49" tall. Allow 1-2 weeks for delivery.